A case, not to be mistaken for a cover, is the type of enclosure that surrounds all but the screen. Cases are primarily focused on the back and sides of the device. Some provide a lip around the screen for a bit of added protection. Some cover part or all of the front bezel. More elaborate units encase the whole device, including the screen. The more protective of that style case has some type of built-in, screen protector. Others are more of a folio-style case. Regardless of which type of case you get, you can kiss the beauty and subtile design of your iPad Air, goodbye. Cases are not usually designed to slip on and off with ease. Therefore, choose well. You will be living with your choice for a long time. The look of the iPad is not the only thing you will be sacrificing, but the weight and thinness. Every case, no matter how thin and light, adds thickness and weight. That is something of a bitter pill to swallow with something like the iPad Air, who's claim to fame is thinness and lightness in the hand. Strap a case on it, and it is as thick and heavy as everything else on the market. One of the most popular type of iPad cases are those with built-in keyboards. There's no denying it. The iPad, for many, is a laptop replacement. Adding an external keyboard still makes it more portable than a laptop, and more useful than a netbook. If you are a case person, and like to do a lot of touch typing, as I do, you are going to want to look at one of the many keyboard cases on the market. A word to the wise, steer clear of off-brand, keyboard cases. The name brands are Logitech, Belkin, and Zagg (owned by Logitech). I am a big fan of Logitech and Zagg. You can't really go wrong with one of their offerings. While cases concentrate on the back and sides, covers are all about the front. Apple is the king of this category with their line of Smart Covers. The main purpose of a cover is to protect the vulnerable screen from scratches and debris. If you leave your iPad on the couch or bed, and you have a cat, I highly recommend a cover. 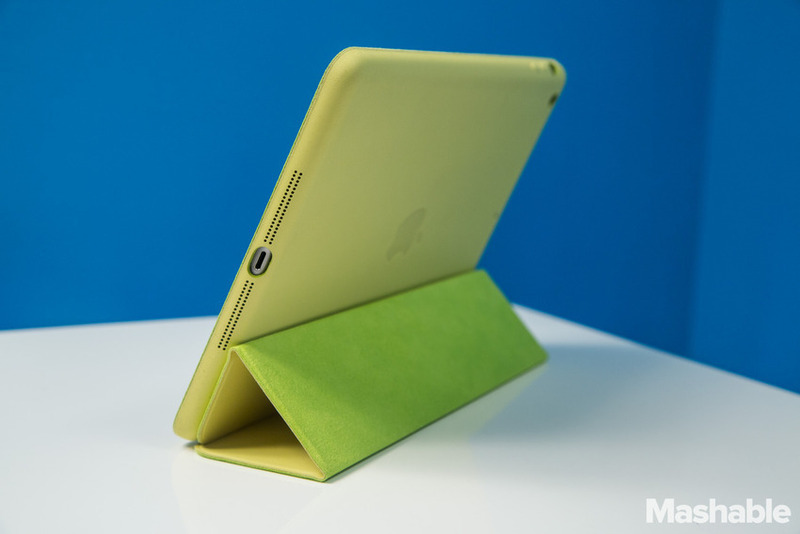 iPad covers attach to the left side, forming a hinge-like book cover. They hold shut by magnets. In the case of Apple's Smart Cover, opening and closing the cover automatically turns the iPad screen on and off, respectively. This setting can be disabled. The Smart Cover also folds into a stand for typing, or watching movies. Like cases, covers also come in the keyboard variety. Logitech Ultrathin Keyboard cover has been best-in-class. Both Logitech and Belkin have announced keyboard covers for the iPad Air. Expect reviews when they are available. The best way to enjoy the industrial design, as well as preserve the thinness and lightness of the iPad Air, is to use it in the raw, the iPad Air, not you. Though, I'm not here to judge. The iPad Air really is a marvel of engineering and industrial design. It is the Platonic form of what a tablet is supposed to be. Even hanging a thin and light cover on it, diminishes the iPad Air ever so slightly. It really does present quite a conundrum. The iPad is so beautiful and perfect the way it is, you want to keep it the way it is. But the only way to keep it the way it is, is to protect it. And the only way to protect it is to cover it, which, in turn, fundamentally changes it into something that is not so beautiful and perfect. The only way to really appreciate it is to use it for all its worth, and to heck with the battle scars. Don't be such a prissy, prima donna! Alas, I am choked by my own hypocrisy. I resell my iPads every year so that I can afford the new one. Battle scars are the death of resale value. I have never had any trouble with scratches on the back of the device, Unless, of course, I drop it. Therefore, I'm a cover man. The screen has to remain pristine. I'm also a keyboard man, so it's keyboard covers for me. My only real advice is to get what you will enjoy. The iPad Air is not precious; it just looks that way. It can take a fall, a bump, a scrape. It was designed to be used, not just admired. It is a lot tougher than you think. Unless you use it in a the harshest of environments, full-body armor is unnecessary. If you see a case or cover that suits your individuality, go for it. Clad your iPad Air based on your personality, not your paranoia, unless, of course, you have a paranoid personality.